Youth must be a TBEY member (Membership Information) to participate in After School Art Program. Summer Arts Camps participants undergo rigorous training with professional artists learning new techniques in a variety of mediums, styles and themes. The camps are designed to prepare members for performing and/or producing work for TBEY’s major productions. Members gain professional experience and appreciation for the creative works and productions that help shape the world around them. Art is very important to a child’s development and many organizations do not have the capacity or resources to offer their members a well rounded arts education. 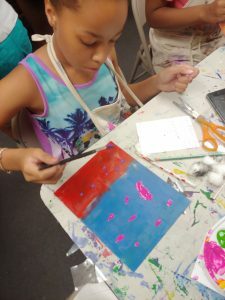 TBEY provides unique arts programming to schools, community organizations, group homes and churches looking to incorporate arts education in their programs. We offer quality workshops, projects and activities that allows youth and families to explore music, theatre, visual arts and dance. We work with any budget size to develop a variety of arts workshops and creative activities to meet the organization’s programming goals. This program is under development and is not be accepting applications at this time. Please check back periodically for program details.